The City of Minneapolis is hosting a free, interactive session on multiple dates in April 2019 to help restaurant owners understand rising labor costs and build a financial plan. Through its B-TAP program, the City contracts with local non-profit organizations focused on entrepreneur training to provide direct services, including accounting, business planning, and compliance consulting. Contact the service provider of your choice directly or contact B-TAP staff for more information at (612) 673-5095 or btap@minneapolismn.gov. The rules, available in the Download Center (to the right), contain the Department's enforcement policy and procedure. The Minimum Wage Ordinance (and Sick and Safe Time Ordinance) required notice poster must be displayed where employees can easily read it in any/all languages needed by 5% or more of employees. It is available for download on the right side of your screen. On March 4, 2019, the Minnesota Court of Appeals affirmed a District Court ruling in favor of the City and its current minimum wage. July 1 raises the wage and the City is letting everyone know. Read all about it here and here. Take appropriate steps now to avoid this! Wages include salary, hourly pay, piece rate pay, commissions, and non-discretionary performance bonuses. Tips and employer payments toward medical benefits plans are not wages. The costs of the following items are not considered wages: 1) uniforms or specially designed clothing required by an employer which is not appropriate for use except in that employment; 2) equipment used in the course of employment, except tools of a trade, a motor vehicle, or other equipment which may be used outside the employment; 3) consumable supplies required in the course of the employment; or 4), or travel expenses in the course of employment, except for those incurred in traveling to or from the employee’s residence. An employer may not deduct these items from an employee’s paycheck if those deductions reduce the employee’s wages below minimum wage. Employers found to have implemented a system of excessive payroll deductions for the purpose of circumventing the minimum wage law may be found to be in violation of the ordinance. What is an hour for purposes of the minimum wage law? Employees must be paid for all time for which the employee performed work for the employer’s benefit. Do tips count toward the minimum wage? Tips and gratuities do not affect the new minimum wage owed to employees. No employer may directly or indirectly credit, apply, or utilize gratuities towards payment of the minimum wage. Tina is a server at a restaurant in Minneapolis. On average, she receives about $8 an hour in tips. Does that count towards the minimum wage her employer must pay her? No, it does not. The employer must pay her at least the minimum wage-not counting tips or gratuities. I am part of a city-approved training or apprenticeship program. does the minimum wage apply to me, too? Yes it does apply, but there are some special considerations. For city-approved training and apprenticeship programs, employers must pay employees under the age of twenty (20) not less than eighty-five (85) percent of the minimum wage rate, rounded up to the nearest nickel, for the first 90 days of employment. After the first 90 days, the employer must pay no less than the applicable minimum wage rate. Jade, age 18, just started work at a city-approved training program at a large business in Minneapolis. What is the minimum wage the employer must pay Jade? On Jan.1, 2018, the minimum wage for large businesses will be $10 an hour. For Jade’s first 90 days at the training program, the employer must pay her at least $8.50 an hour (or 85 percent of the applicable minimum wage). After 90 days, the employer must pay her at least $10 an hour (the applicable minimum wage rate for large employers in 2018). how does an employer become a city-approved training or apprenticeship program? Applications are available to download here or in download center above. Any employer may apply to become a city-approved training or apprenticeship program (for purposes of the Minneapolis Minimum Wage Ordinance) by completing an application and emailing it to minwage@minneapolismn.gov. Applicants will receive confirmation of their submission and directions regarding any next steps within several business days. Applications are evaluated by the Minneapolis Department of Community Planning and Economic Development (CPED). Criteria for approved youth training programs is developed by CPED and approved by the city's Workforce Investment Board with input from current service providers. A complete listing of the criteria here or in the download center above. The criteria should be reviewed by applicants before submitting an application. Note: a listing of all city-approved training or apprenticeship programs is also available for download in the download center above. To determine an employer’s size, count the total number of persons performing work for compensation. Add each person per week for each week of the previous calendar year and divide by 52. Include full-time, part-time, jointly-employed, paid interns, seasonal, and temporary workers, no matter where they are located. This calculation determines whether an employer is considered “large” or “small” for purposes of the ordinance ("small" is defined as 100 or fewer). If an employer is a franchise or a full-service restaurant, see FAQ's in the Download Center (upper right on this webpage). Robot World, a business in Minneapolis, employed 30 full-time workers, 22 part-time workers, and two temp workers each week last year. Robot World averaged a total of 54 (30 + 22 + 2) workers per week. It is a “small business” for purposes of the minimum wage ordinance because 54 is less than 100. Tree World is a business in Minneapolis. It is open all year round, but there is a lot of variation in the number of persons working during the year. For 12 weeks of the year, it employs 150 full-time workers. During the slowest 10 weeks, it only employs 25. For the remaining 30 weeks, it employs 50 workers. WHAT IF I HAVE A NEW BUSINESS THAT HAS BEEN OPEN LESS THAN A YEAR? ​To determine the size of a new business, count the average number of workers per week during the first 90 days after the new business began operation. Then determine if it is considered a “large” or “small” business under the ordinance. ​“Large business” means all employers that had more than one hundred (100) persons performing work for compensation in the previous calendar year. ​“Small business” means all employers that had one hundred (100) or fewer persons performing work for compensation in the previous calendar year. How do I calculate business size if it is a franchise? ​If you operate your business pursuant to Minnesota's franchise law, Minn. Stat. 80C.01, and the franchisor and all franchisees own or operate an aggregate of more than ten (10) locations nationally, then you are a large business under the new Minimum Wage ordinance. You do not need to count the total number of employees. ARE THERE ANY SPECIAL RULES FOR RESTAURANTS? If your business is a full service restaurant in Minneapolis which is not operated pursuant to Minnesota’s franchise law and has fewer than ten (10) locations nationally, each restaurant location is treated as a single, unique employer solely for the purposes of determining business size. So, you will need to count the number of employees in each restaurant location to determine whether it is a “large” or a “small” business under the new ordinance. For purposes of this rule, a full-service restaurant is an establishment in which food and beverage are served and which provides table service to customers to facilitate the ordering and delivery of food and beverage. ARE COLLECTIVE BARGAINING AGREEMENTS EXEMPT? ​No. Employers operating under a collective bargaining agreement (CBA) must pay all employees at least the minimum hourly wage. Yes. Employers must display a workplace notice poster within each of their facilities in Minneapolis in a visible and accessible location. The poster should be displayed where employees can easily read it. Employers must display the poster in English and in each of the primary language(s) spoken by employees at the particular workplace, if published by the Department. WHAT DOCUMENTS ARE EMPLOYERS REQUIRED TO KEEP? If an employee works two or more hours within the City in a particular week, the employee must be paid at least the minimum wage for the time worked within the City. Employees who work less than two hours in a particular week within the City are not covered by the ordinance. Regardless of where an employer is located, it must pay at least the Minneapolis minimum wage rate, for time worked in the City of Minneapolis, to any employee who performs at least two hours of work in a calendar week within the City of Minneapolis. For purposes of this rule, a calendar week runs from Monday to Sunday. An employer may make a reasonable estimate of an employee’s time spent working in the City for purposes of determining if any employee has performed at least two hours of work in a calendar week within the City. Documentation of how the reasonable estimate was derived may include, but is not limited to, dispatch logs, delivery addresses and standard estimated travel times, or historical averages. Smart phone apps also exist for the purpose of GPS location and payroll time tracking. where can i receive more information? ​Labor Standards Enforcement Division staff in the Minneapolis Department of Civil Rights will promptly respond to concerns, provide technical assistance, or answer questions from anyone. Email minwage@minneapolismn.gov or call (​612) 673-3000 (311) or (612) 673-2157 (TTY) for more information. If you would like to read the complete Minimum Wage FAQs, please download the file in the Download Center to the right. 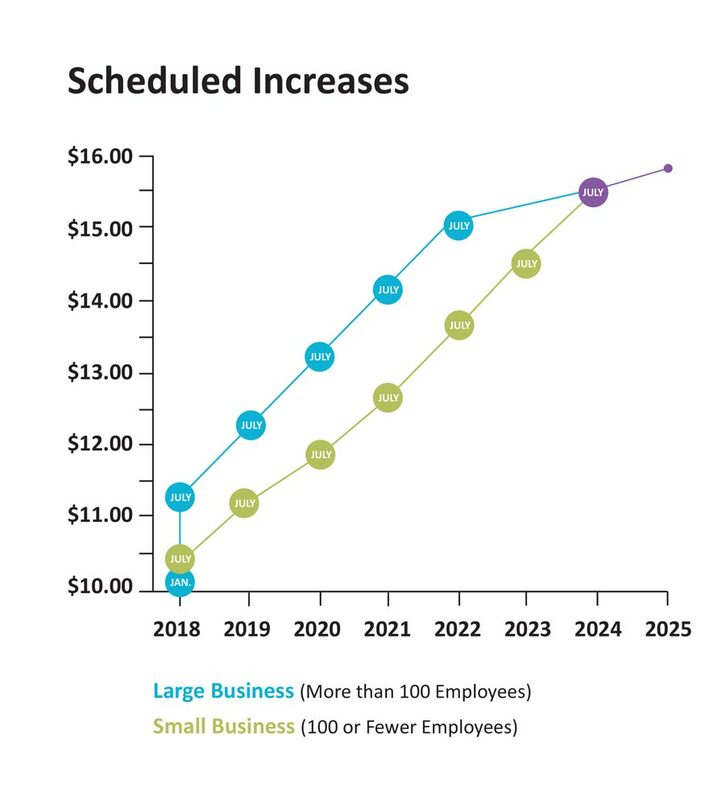 ​Until July 1, 2024, the minimum wage rate depends upon an employer’s size (total number of workers). The minimum wage will then continue increasing for everyone (beyond $15) yearly to account for inflation. ​For reasonable accommodations or alternative formats, contact 311. People who are deaf or hard of hearing can use a relay service to call 311 at 612-673-3000. TTY users can call 612-673-2157 or 612-673-2626.